The Primary Futures programme aims to raise the aspirations of primary school children by helping them to see the link between their lessons and the world of work. The programme, run by the charity Education and Employers, uses people from a variety of different backgrounds to visit schools and talk to children about their jobs and highlight the importance of good literacy and numeracy skills. 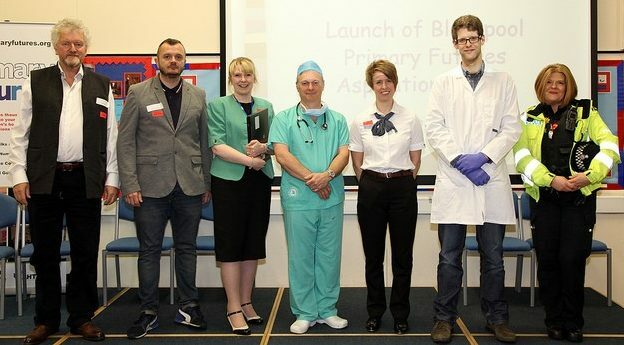 A number of volunteers from a range of departments went to primary schools across the Blackpool area for a series of half-day events as part of Blackpool Aspirations Week. It wasn’t a huge time commitment but it had a big impact on the pupils, and it was a rewarding opportunity to use those Civil Service volunteering days. I took part in two events, and I’m glad I did. The usual format is for children to ask five volunteers questions to try to guess their occupations. The volunteers then go into classrooms to talk to pupils in small groups about their job. In my case (perhaps unsurprisingly) being a senior casework executive for HM Land Registry wasn’t easily identifiable for pupils, but it was great fun being involved in the classroom discussions. How many hours do you work? Why did you choose your job? Do you work inside all the time? Which do you use more, English or maths? The pupils were very interested to hear that I do so much reading that my computer has two monitors! So would I do it again? Would I recommend it to others? Yes and yes! The events were really well organised and the pupils and staff were very welcoming. Feedback from other Civil Service volunteers was similar, and they all said they would recommend it, with words such as ‘rewarding’ and ‘fun’ featuring a lot. The event also showcased to pupils and staff how very different the various Civil Service departments are, and what a variety of roles we can offer. There was a good mix of about 20 people from all kinds of jobs at both events I attended, so I found it a good way to build personal networks too. It was great to be part of such an important event in the local community, and it was heartening to see the coverage in the local media. The programme always needs enthusiastic volunteers, so if this interests you please contact me or see Primary Futures to find out more. Wouldn’t you like to help children in a school near you?